In 1969, Dr. Smith graduated from Bristol University’s School of Medicine in the UK, at which time he was awarded Bachelor of Medicine and Bachelor of Surgery Degrees. He then spent time in house jobs to become fully registered with the General Medical Council. After that, he worked at the Bristol Royal Infirmary, spending six months as a senior house officer in orthopaedic surgery in trauma and six months as a casualty officer. Following that, in 1971 he spent a year at Bristol University in the Department of Anatomy as an anatomy demonstrator, teaching anatomy to medical students and college surgery candidates preparing for their fellowship primary exams. In 1972 he was offered an opportunity to study orthopaedic surgery in Canada at McMaster University where he did a full residency program. Between 1976 and 1977, he spent a year as a post-graduate fellow at Rancho Los Amigos in Downey, California where he worked in the spinal injury service and the arthritis surgical service. Later in 1977, he graduated with a fellowship of the Royal College of Surgeons in Surgery, Subdivision Orthopaedics. After that, in 1977 he returned to McMaster and was given a consultant position in the Department of Orthopaedic Surgery dealing with orthopaedic elective and emergency services including multiple trauma. For the first 17 years of his time there, he was doing the majority of the spinal injury surgery and a large amount of multiple trauma plus becoming Director of Reconstructive Surgery at Chedoke Hospital division of the University Teaching Network in Hamilton for McMaster University. Subsequently, in 1992 he moved to the McMaster Medical Centre, specialising in orthopaedic and reconstructive surgery until that division was closed in 2002. He was then moved to the Juravinski Hospital, where the principal emphasis was on hip and knee arthroplasty, including revision surgery and surgery for musculo-skeletal primary and secondary tumours, together with lower limb trauma including pathological fractures and hip fractures. All that time, he has also been a teaching Associate Professor of Surgery at McMaster University. This job has included multiple lectures around the world, multiple randomized short studies in various aspects of orthopaedic surgery and management thereof. 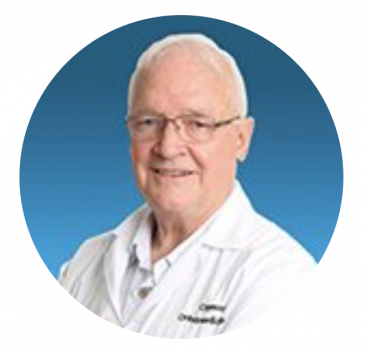 He was a founder member of the Cayman Orthopaedic Group, set up in 1995 comprising orthopaedic surgeons from Canada who rotate on a regular basis to provide a wide blend of subspecialities to residents of the Cayman Islands. Since 2017, he has also been the medical director of Pensum Regenerative Medicine.